Jim Steinman's epic soundtrack Bat Out Of Hell is brought to life through a rock and roll love story. Bat Out Of Hell the Musical is the most groundbreaking production I have witnessed on stage. The production values are out of this world, and it is a show that has taken a huge leap forwards to create a extraordinary piece of musical theatre that is guaranteed to leave you all revved up. Manchester's Opera House has been transformed into an epic dystopian world. It is like literally stepping into another world as they create the most powerful set theatre has ever seen. Using every inch of the stage, they have a multitude of levels – but the intimacy isn't lost. Their innovative use of live camera work follows the cast members and is projected on the many screens across the stage which works excellently. It mirrors the futuristic ambience of the performance, whilst also providing completely different insight into the passionate scenes – it is a visual masterpiece. The tremendous staging is matched by the unbelievable talent of the cast. It's the story of love, passion and teenage angst. 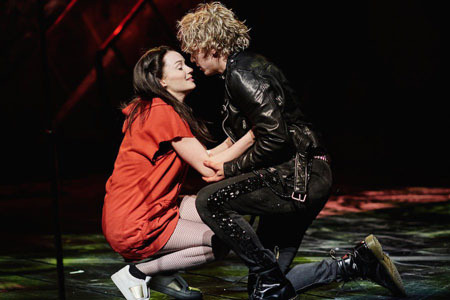 It's a Romeo and Juliet love story, as the fearless forever young youth Strat (Andrew Polec) falls for the oppressed daughter of the head of police Raven (Christina Bennington), who is desperate to leave Falco tower and escape her over-powering parents and experience life for herself. Also displaying phenomenal vocals are Danielle Steers as the feisty Zahara, and Dom Hartley-Harris as Jagwire. Absolutely blowing the roof off with their sensational riffs and unbelievable belts, their duet Two Out Of Three Ain't Bad is theatrical in every way. The production itself is bursting with heated duets, and Raven's parents Falco (Rob Fowler) and Sloane (Sharon Sexton) give a fervent performance flipping from ardent love to raged conflict, as they struggle to maintain their marriage. Bat Out Of Hell isn't just a musical, it's an experience.